Blackjack Pizza is committed to providing Loveland with the best pizza in town, using only the freshest ingredients. 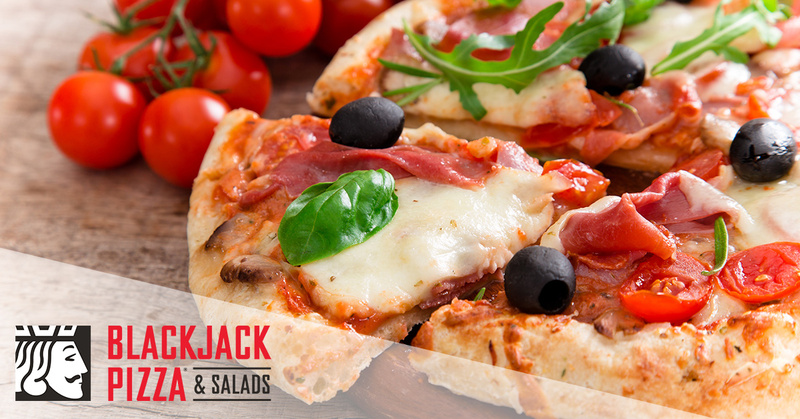 Whether you’re in need of a fantastic lunch or a delicious dinner, Blackjack Pizza is here to bring you a delicious pizza made to order, delivered direct to you and ready to eat. Call us or place your order online today! Pizza is many things, including the perfect comfort food. While some may not completely understanding what makes pizza the perfect comfort food, in this post, we will look at a few things that contribute to this. There are so many legitimate reasons to partake in comfort food, from a stressful day at work or school to a painful breakup to feeling homesick. Whatever the reason may be, comfort food is always there for us when we need it most. With this in mind, on the occasions in which we draw on our favorite comfort foods for solace, the last thing in the world that we want is to have to work just to enjoy a comforting meal. By ordering a pizza from Blackjack Pizza in Loveland, not only will you be able to get the comfort you need from a fresh pizza dressed with your favorite toppings, all you have to do is place your order and wait for us to deliver it right to your door. Not in the mood to talk? No problem! We offer online ordering services as well, making the process of ordering your favorite comfort food even easier. No need to bother with making a trip to the grocery store to buy all the ingredients needed to make meatloaf, a casserole or another sort of comfort food that requires work on your end. Here and now, pizza toppings have moved far beyond the simplicity of sausage and pepperoni. Is your idea of comfort food a pizza with Mediterranean flair? We offer a delicious Mediterranean pizza that’s topped with fresh chicken breast, red onion, black and green olives, olive oil, feta cheese, fresh tomatoes and mozzarella cheese, served on our signature thin and crispy crust. Are you in need of some comfort that only the flavor of the southwest can provide you with? Our Santa Fe features a combination of a 505 Green Chile sauce base, red onions, black olives, fresh tomatoes, chicken breast, cheddar cheese, and green chiles that work together to create a truly delicious and flavorful pie that is distinctively southwestern. You don’t have to settle for a simple pizza with everyday toppings! Comfort food is about getting what you want, and lucky for you, Blackjack Pizza in Loveland offers an array of toppings to satisfy your needs. At the end of the day, comfort food should be something that provides you with a sense of calm and relief from whatever may be causing you stress. With this in mind, pizza can bring you a sense of comfort that many foods cannot. Using only the highest quality and freshest ingredients, by ordering a pizza from Blackjack Pizza in Loveland, you will be receiving a fresh and hot pie made with your toppings and crust style of choice. Whether you’re struggling with the frigid temperatures that Colorado winters bring or your soul needs warming, a hot pizza from Blackjack Pizza will surely bring you with the comfort that you need to make you feel great. Try and find something more comforting than a hot and delicious pizza made fresh and delivered right to your doorstep, we dare you. Those are just a few reasons as to why pizza is a fantastic comfort food to order this winter. Whether you’ve got the winter blues, are in need of some inner warmth, or just need a little cheesy pick-me-up, Blackjack Pizza is here to provide you with a wide variety of pies that will bring comfort to even the pickiest of tastes. Best of all, we offer gluten-free and vegetarian pizzas for those of you with dietary restrictions. Call us at 970.669.1717 or order online. Mention our coupons and the BlackJack crew will get you exactly what you need. Place your order today!